From left: FNF's Resident Representative Dr. Ronald Meinardus with FEF Chairman Dr. Felipe Medalla, UP School of Economics Professor Emmanuel De Dios and FEF President Professor Alex Magno. The Friedrich Naumann Foundation co-sponsored public dialogues on reform policies in two different yet equally pressing areas — the fiscal situation and the state of the environment. 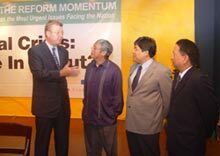 First, Finance Secretary Cesar Purisima outlined his policies at a well attended conference entitled “Fiscal Crisis: Are we in or out?” organized by the Foundation for Economic Freedom (FEF) on February 23, 2005 in Makati City. The newly appointed secretary presented a threefold strategy to prevent a pending fiscal crisis: reforming the tax enforcement structure, creating additional taxes — VAT and excise tax — and privatizing government owned companies. “My first agenda is collection, collection, collection … and privatization is going to be a key part of the program,” said Purisima who welcomed the opportunity to engage in a public dialogue with important stakeholders. The conference with Secretary Purisima was the first in a series of public forums that will highlight the different reform initiatives currently underway in the Philippines.